CD to MP3 Maker is an extremely easy to use cd ripper and audio converter for Windows 9X/NT/Me/2000/XP/Vista/7. It can convert Audio-CD(CDA) to MP3, WAV, WMA, OGG, AAC, APE, FLAC, MP2, MP4, M4A, MPC(MusePack), AC3, TTA,SPX(Speex), and WavePack. It can convert audio between most popular audio formats: wma to mp4, flac to aac, ape to flac, wv to mp3, wav to flac, mp2 to mp3, mp3 to aac, ape to mp3, tta to mp3, ac3 to mp3, flac to mp3, midi to mp3,midi to ape, midi to flac etc. It is a six-in-one music converter that includes the following modules: CD ripper, Audio converter,video to audio converter, Audio cutter, Audio joiner,audio player. Rip Audio-CD tracks to MP3, WAV, WMA, OGG, AAC ,APE,FLAC, MP2,MP4, M4A,MPC(MusePack),AC3, TTA,SPX(Speex), and WavePack. Audio Extractor & Audio Converter Extract audio from videos (e.g. convert AVI to MP3); convert between audio files such as MP3, WMA, WAV, RA, M4A, etc. ; Rip CD to music files; Convert lossless audios. Audio joiner may merge Several Audio Files into One: Enjoy your audio collections differently by merging several of them together. Play audio and video using the built-in audio player.Support over 70 audio and video formats. Convert to over 15 audio formats, including aac (.aac, m4a (iPod aac and Apple Lossless), .m4b, alac, .mp4), .mp3, MusePack (.mpc), .ogg, .wma, .flac, .ape, .wav, .tta, Speex (.spx), .mp2,.ac3. Split a Single File into Several: Is a audio file too large for your iPod, iPhone, PSP, or mobile phone? Simply split it into several files to make it fit onto your multimedia device exactly. Have A nice and easy understandable user interface. 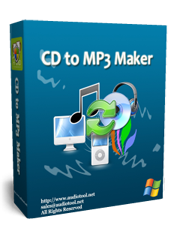 With its advanced features, easy-to-use interface, and customizable options, CD to MP3 Maker is just what you are searching for. It runs well on all 32/64-bit Windows operating systems including Windows 95/98/NT/2000/ME/XP/Vista/7.